A nationwide campaign called "Stop the Bleed" offers a free first-aid training class that teaches how to stop bleeding so a person doesn't die before medical help can arrive. See photos. WASHINGTON — If you were faced with a life or death situation would you know how to act? In a world of mass shootings, terror attacks and car crashes, one campaign is teaching people how to “Stop the Bleed,” since a person can bleed to death in as little as five minutes. “Stop the Bleed” is a nationwide effort which offers a free first-aid training class that teaches how to stop bleeding so a person doesn’t die before medical help can arrive. “Unfortunately, we are having a lot of mass shooting incidents around the country and we want the lay person to be able to step in and intervene wherever possible. 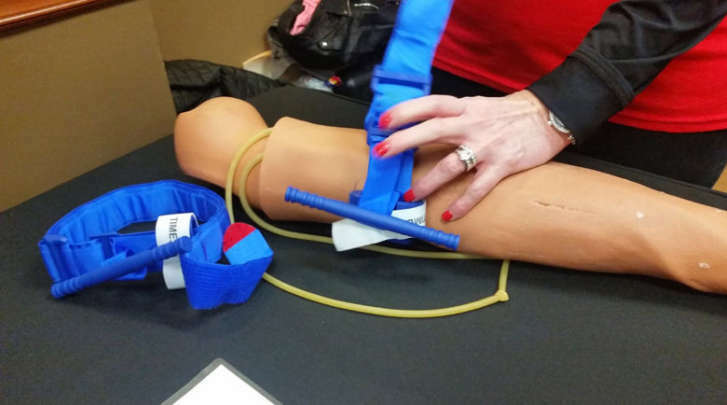 You could potentially save a life or a limb with learning how to control the bleeding on the scene,” said Dawn Moreland with the trauma services at the University of Maryland Prince George’s Hospital Center. The campaign trains the public how to use a tourniquet, how to stuff a wound and apply pressure until EMS can get to the scene. Moreland says learning to control bleeding on the scene might be the only shot at saving a person’s life until rescue can arrive. The hospital offers the “Stop the Bleed” training class. “What we’re doing is show them ways to potentially save a life by use of a tourniquet or a belt, stuffing the wounds with a clean gauze or a T-shirt or a towel,” Moreland said. The hospital has been with the campaign just about a year, according to Moreland. The training empowers people to help each other in the crucial minutes before professional help arrives, Moreland says.